AIA Document B201™–2007 replaces AIA Document B141™–1997 Part 2 (expired 2009). 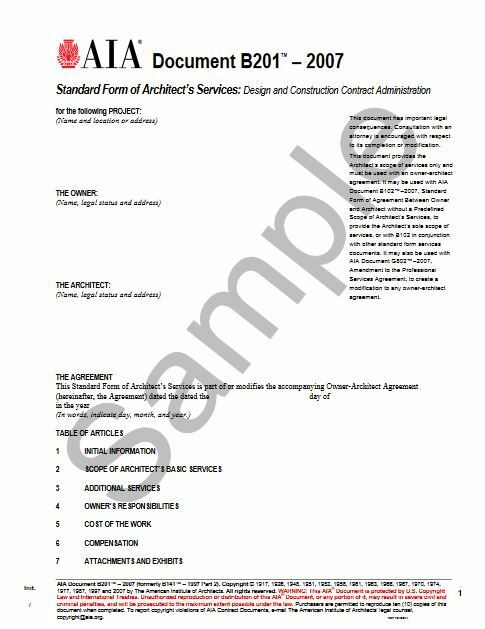 AIA Document B201–2007 defines the architect’s traditional scope of services for design and construction contract administration in a standard form that the owner and architect can modify to suit the needs of the project. The services set forth in B201–2007 parallel those set forth in AIA Document B101™–2007: the traditional division of services into basic and additional services, with five phases of basic services. 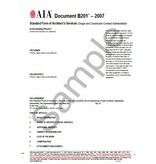 B201–2007 may be used in two ways: (1) incorporated into the owner/architect agreement as the architect’s sole scope of services or in conjunction with other scope of services Document, or (2) attached to AIA Document G802™–2007, Amendment to the Professional Services Agreement, to create a modification to an existing owner/architect agreement. B201–2007 is a scope of services document only and may not be used as a stand-alone owner/architect agreement.